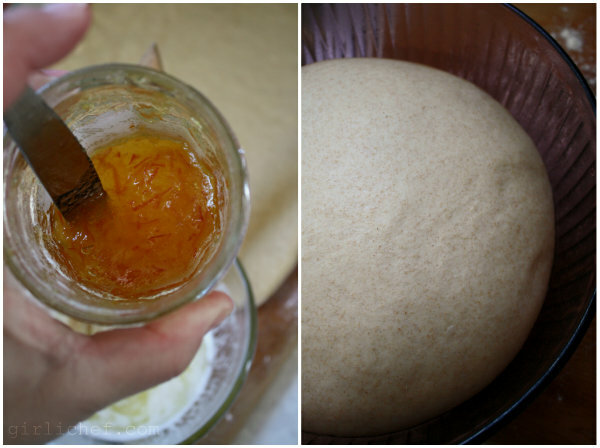 Fantan Rolls: Orange Marmalade + Cinnamon-Sugar. It's official, I'm a Babe. Yup, it's true. I am a Babe. For a couple of years now, I have been baking alongside the Babes as a Buddy. But this month, I have officially been welcomed into the racy* circle of lovely ladies and given the title of "Babe". I'm honored! And to kick off my very first month as an official babe, I made our bread of the month (chosen and hosted by Babe Elle), Fantan Rolls. Fantans are basically a mini... or individually portioned... little pull-apart breads like this one. It just so happens that that is one of THE most requested types of bread in my house - especially by my littlest man. If you check out Elle's original recipe, you'll see that she used orange marmalade in hers. It looked so sunny and jewel-like that I had to use marmalade myself. 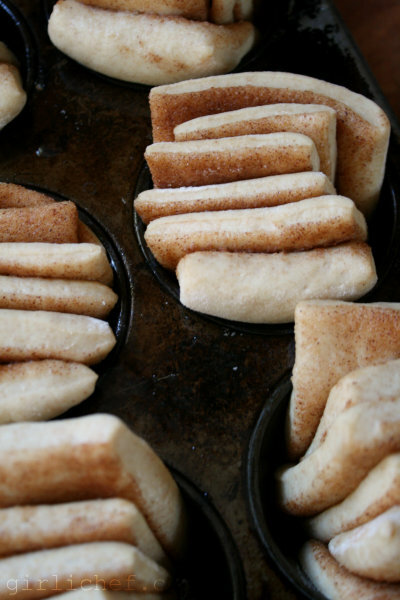 But since I know the fam's favorite filling in this style of bread is cinnamon-sugar, I made half of the Fantans that way. I really loved the lightly sweetened dough that is speckled with hints of whole wheat and nutmeg. 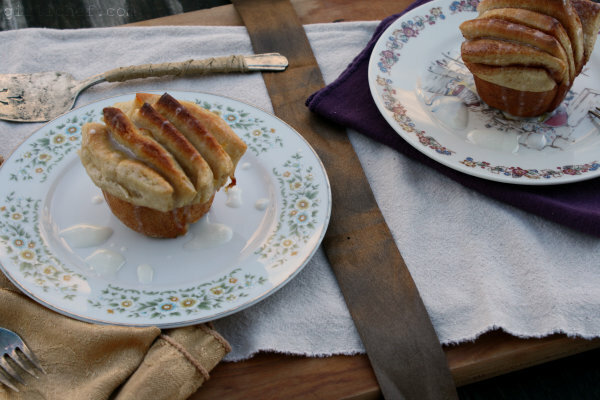 Plus, once drizzled with a little icing, these rolls would make the perfect addition to any breakfast or brunch table! I am aching to make a savory version, though...maybe half using smooshed, roasted garlic and brie, and half using salty olive tapenade. I did two things slightly different when making and forming the dough than the original method stated. Number one, I used my trusty bread machine to do all of the mixing and kneading (it was a busy weekend - that half hour with free hands really helped). And number two, I found that cutting the dough into all squares before stacking (as opposed to stacking the long strips and then cutting) really made for a much easier time assembling the dough. So what do you think? Would you go sweet or savory? And what would you fill your fantan rolls with? Combine yeast, warm water, and flour in a bowl. Let sit at room temperature for at least 4 hours, or up to overnight; it should be a bubbly. Combine the evaporated milk, butter, and maple syrup in a small saucepan and heat slowly until butter is just about melted. Turn off heat and swirl to finish melting butter. Let cool to 110° F if not at that temperature already. Place the flours, salt, and nutmeg into a large bowl and mix to combine. Make a well in the center and add the yeast mixture; start stirring. Add milk mixture and continue to stir until fully incorporated, switching to your hands when too stiff for spoon. Turn out onto a lightly floured work surface and knead until smooth and silky; should be just tacky to the touch, but not sticky. If needed, add a bit of additional flour while kneading. Place in a lightly oiled bowl, turning to coat. Cover with plastic wrap and set in a warm place to rise until doubled in size, ~1 hour. Dust your work surface with flour and turn the dough out onto it. Punch it down, then divide it in half (to make 12 really large rolls) or in thirds (to make 18 medium-large rolls). Wrap unused portion in the plastic wrap and set aside while working with other dough. 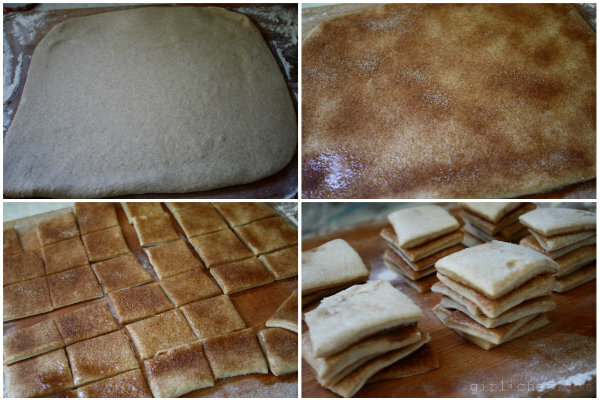 One at a time, roll the dough portion into a 12"×12" square (or square-ish shape). Brush dough with half (or a third) of the melted butter. 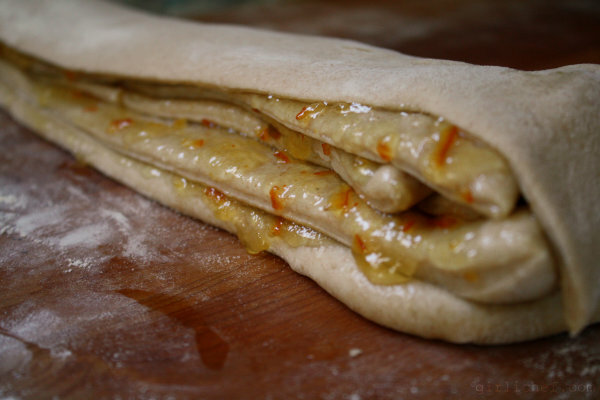 Spread the surface of the dough with about ½ (or a third) the warmed filling. Cut into 6 equal strips. Cut again the opposite way to make 6 equal squares per row (you should wind up with 36 squares). Pile the squares into stacks of 6, turning the top square on each stack filling side down. Place each stack into a greased/buttered muffin tin, standing up so the layers are visible. Gently fan them open. Each will have six dough pieces with filling in between. Repeat with the remaining dough and the rest of the filling for the other six cups of the muffin tin (or use an extra half of a muffin tin if making 18). Cover with a plastic wrap or a clean kitchen towel and let the rolls rise in a draft free spot at warm room temperature until doubled in size, 45-60 minutes. Place the rack in the middle and preheat the oven to 375° F during last 15-20 minutes of rise time. 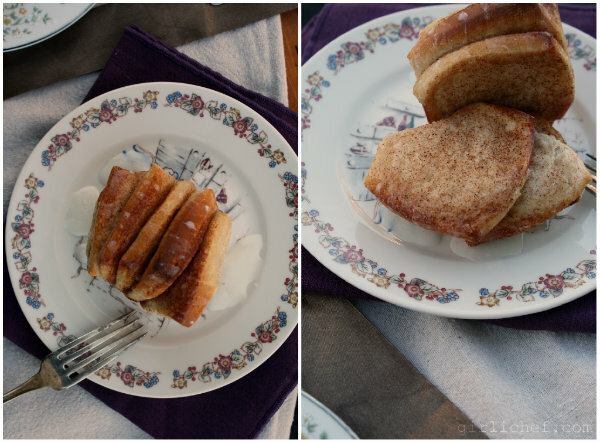 You could also use cinnamon-sugar in place of jam or marmalade - or do half and half. You could also add finely chopped nuts or dried fruit. Try making a savory version by leaving out the nutmeg and maple syrup, and using a savory filling (like pesto, tapenade, etc.). If you like, you can whisk together 1 teaspoon milk with enough confectioners' sugar to make a thick glaze. Drizzle over the rolls and let icing harden a bit before serving. If you don't have any evaporated milk, you can stir together ⅔ cup non-fat powdered milk with ¾ cup warm water until dissolved; this should yield 1 cup. These rising times were what worked in my kitchen. Depending on the temperature of yours, it's possible it could take a bit longer. Just keep an eye on the dough. Also, I'll admit that I like to use my bread machine to mix up the dough when I'm busy and want to use the mixing and kneading time to get something else done. Simply place all of the ingredients into the bread machine in the order suggested by the manufacturer (with the overnight starter added last), and let run through mixing and kneading cycles. Remove and place dough in oiled bowl for first rise and continue as directed. I did this and it worked beautifully. I was also too lazy to mix the powdered milk and water that I used in place of evaporated milk, so I added the water with the wet ingredients and the powdered milk with the dry - didn't make a difference. 1. Lively, entertaining, and sexually titillating. 2. (of a wine, flavor, etc.) Having a characteristic quality in a high degree. 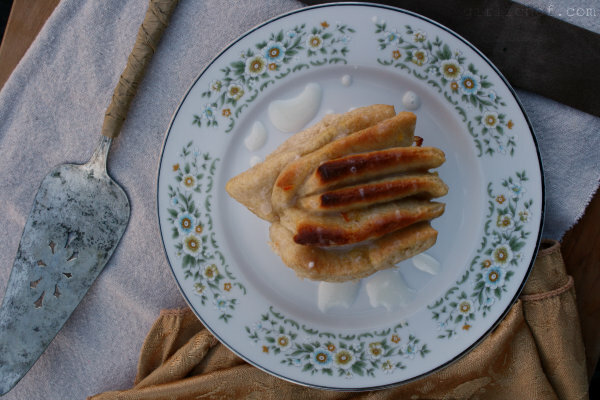 Babe Elle of Feeding My Enthusiasms is the Bread Baking Babes host kitchen this month. If you'd like to be a buddy this month, bake your fantans and send the link over to Elle by the 29th!